Selections from an Appendix of 59 images of classified government documents, pp. 219-84. 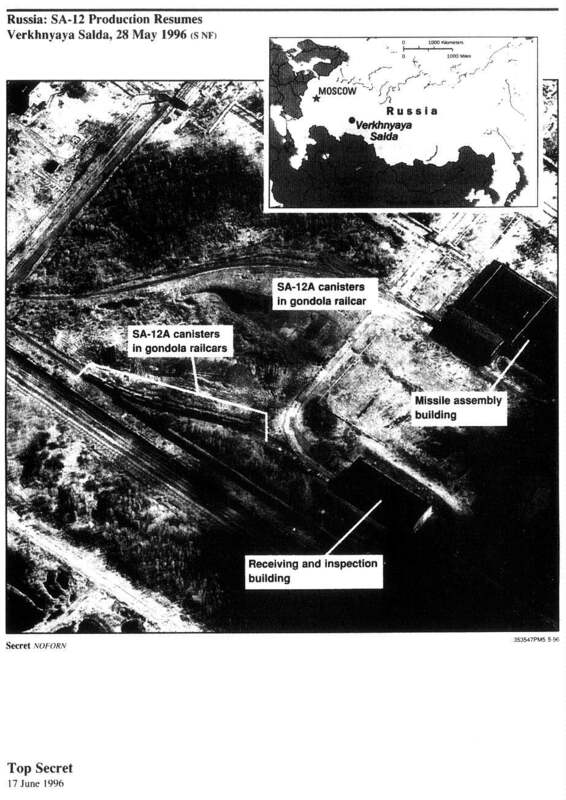 Satellite imagery suggests that a surge in production of SA-12 surface-to-air missiles is imminent: thc imagery shows that last month at least 38 SA-12A canisters were moved into the production buildings at the Verkhnyaya Salda missile assembly facility which has been almost inactive for two years. Special intelligence and clandestine sources indicate that Russia has negotiated sales with a number of countries, including China, India, the UAE, and Cyprus. There is no evidence that any contract has been signed, however. -- The missile would provide an anti-tactical-ballistic missile capability to countries concerned about tactical ballistic missile threats. Special intelligence, clandestine reports, and press reports indicate Russia has recently concluded several contracts to sell modern SAM systems and their technology. Included in these sales are the first exports of the SA-15, SA-19. and SA-11 to countries other than former Warsaw Pact members. -- According to a source of the US military, a Peruvian group recently went to Russia for training on the SA-19 Tunguska gun-missile system in anticipation of receiving the system in two to three months. The SA-19 is the first deployed system to incorporate guns and missiles on a single, self-propelled platform. -- Satellite imagery shows that India received six SA-19 systems in February. By late March, India expected to receive another SA-19 shipment, according to special intelligence. Russian press reports assert that such sales have helped the missile builders avoid collapse. The sales also contribute to funding further air defense R&D and production. 1. Chinese officials -- probably from the China Nuclear Energy Industry Corporation (CNEIC) -- recently met with Ghulam Kibna, Pakistan's nuclear and missile procurement officer in Beijing, to discuss the 30 August US demarche on China's sale of diagnostic equipment and a furnace to unsafeguarded nuclear facilities in Pakistan, according to an intercepted message. Kibna said Chinese personnel were already in Pakistan to install the equipment, which an intercept in August indicated was to be delivered on 2 September. -- A Chinese nuclear official informally told our Embassy on Wednesday that the equipment was sent late last year or early this year, but he claimed not to know the final end user at the Pakistani Atomic Energy Commission. 3. The PAEC's chainnan told Kibna any decision to share documents with others would require the approval of Pakistan's President or Prime Minister. Kibna suggested possible language for the false end user certificatess to make it appear that one item -- possibly the diagnostic equipment -- was intended for the safeguarded Chasma nuclear power plasm which Chinese firms are building. -- The intercept indicates Kibna also suggested to the Chinese that all remaning contracts, apparently for unsafeguarded facilities, be canceled and new ones drawn up naming unobjectionable end users. This memorandum was pnepared by Ken Sichel and Ray Bogusz of the office of Weapons Technology and Proliferation with a contribution from Ted Clark from the office of East Asian Analysis. The author can be reached on 70481 secure. 4. The Chinese reportedly told Kibria the "secret"-- apparently the latest sale -- had leaked in Pakistan. In response, Islamabad ordered Kibna to stop using telephones and faxes and to confine future messages to the diplomatic pouch. -- If implemented, the order will severely limit our ability to monitor Chinese-Pakistani nuclear and, to a lesser extent, ballistic missile cooperation. Pakistan has ordered a further payment to China on the 1988 M-11 deal, and Chinese engineers plan soon to provide further M-11 training to the Pakistani army. Though we continue to receive reports that M- l l s are in Pakistan, the army has made no plans for field deployment and is just beginning to formulate an operational doctrine for the system. Pakistan on August 22 made arrangements to pay China Precision Machinery Import/Export Corporation $15 million on the 1988 contract for M-11 missiles, launchers, and support equipment, according to special intelligence. We have no indication of upcoming shipments or other events that would explain the timing of this payment. The last known payment on this contract -- $83 million -- was in late 1992 for unspecified "goods" shipped at that time; subsequent reporting has provided strong evidence that missiles were part of the cargo. A Chinese team is expected to arrive at Pakistan's Sargodha missile facility in September to provide training on the M-11, probably on the handling of spare parts, according to special intelligence and a clandestine source. This team probably is separate from one that reportedly will arrive later this year -- once the Sargodha facility is complete -- to unpack and assemble M-11s. This latter team's arrival has been repeatedly delayed by the Pakistanis, ostensibly because of the need to complete construction at Sargodha, but almost certainly also because of the greater likelihood of US detection of the missiles once assembled. At least some of the M-11s that had been dispersed at military locations throughout Pakistan are now being stored at Sargodha, according to a clandestine source. But we have yet to see operational missiles on imagery. April imagery showed canisters at Sargodha similar to ones seen at the M-11 production facility in China. But a missile-handling exercise was under way at Sargodha at that time, and the canisters were assessed to be mock-ups for use in that exercise. A Russian delegation headed by Energy and Fuels Minister Rodionov left yesterday for Baghdad with $10-12 billion in economic agreements to be signed. The delegation includes the directors of at least nine oil companies, the chief of the Rosvooruzheniye arms exporting firm, and of finials from the Foreign Economic Relations, Foreign Affairs, and Industrial Ministries, according to special intelligence. Russian officials have said publicly the pacts to be signed involve Russian development of the West Kurna and North Rumayla oilfields, two of the Middle East's largest, as well as expansion of the Haditha-Rumaila oil pipeline and Nasiriyah-Baghdad gas pipeline, all Soviet-era projects interrupted by the Gulf war. Moscow has pledged to honor UN sanctions but has indicated it is eager to be in position to pursue its economic interests. Iraqi Deputy Prime Minister Aziz recently assured Russian officials when he was in Moscow that Iraqi officials would give priority to Russians in the execution of strategic projects.